People say shitamachi has a shortfall of greenery. But you see a lot of greenery. Residents reclaim the footpath to plant stuff on the street. You could almost say it’s greener than other parts of town, because people consciously green their worlds. Look at all the potplants. Whole trees as well. Probably branching beyond regulations. Looks all right. People say I have too much greenery and my store could be mistaken for a plant shop, says Kazue Ono. She grew up in Kanda then moved to Nishi Asakusa. She started her own bakery here, down the street from Tawaramachi, about 35 years ago – after a walk in a French forest in autumn. She loves fairy tales, and fell in love with those woods, and the fallen leaves underfoot. Different from Japanese leaves, she says. Those leaves in that forest made a real saku-saku sound. 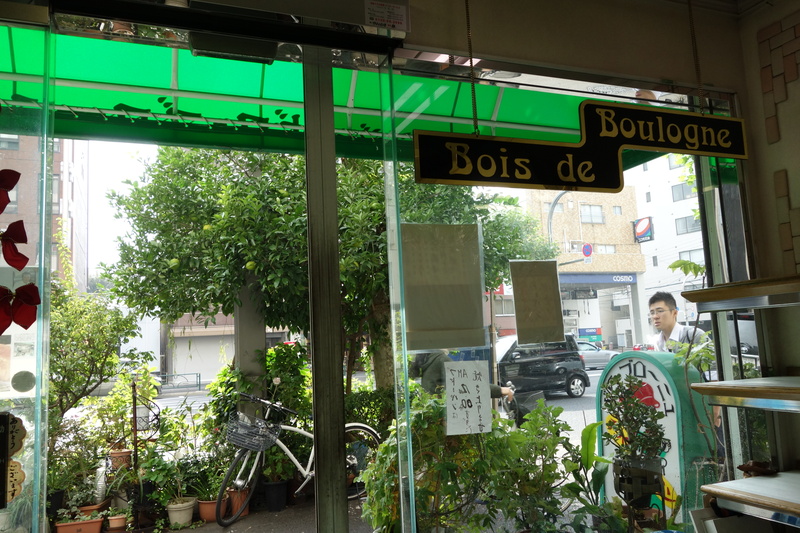 She named her bakery Bois de Boulogne. You often wondered as you passed, about the dramatic portrait above the cash register. It looks like the Kannon goddess of mercy in a sunburst. That would make sense for Asakusa, where Kannon reigns at Sensoji. 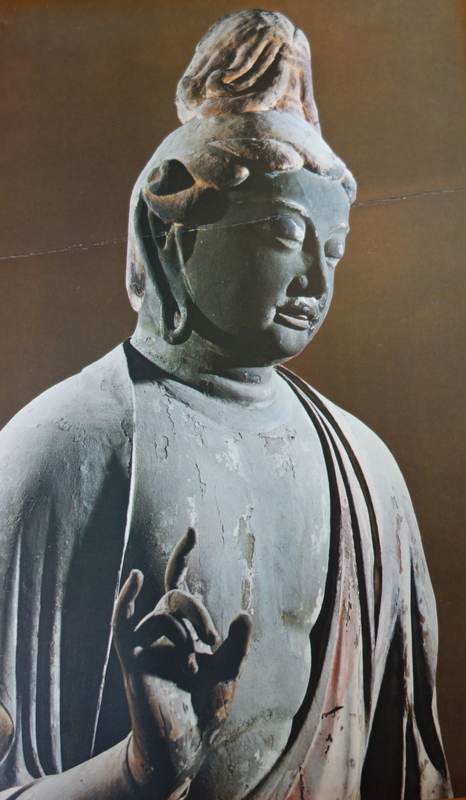 Ono says, It’s Gigei-ten, eighth-century statue in the temple of Akishino-ji in Nara, deity of artists. She says, I made it, about 40 years ago. It’s pieces of cloth glued down. A craft called hari-e. Not many people do it. I don’t find time to do it anymore because I’m baking. But he’s the god of doing creative things, like drawing pictures, making things from beads, shugei – lace. And I like the gentle face. From behind the counter she pulls out a very old postcard from the temple. Oh thank you, do we look a bit alike? She doesn’t usually open on Sundays but she’s selling off the leftover from the weekend temple batch. You buy some raisin rusks. 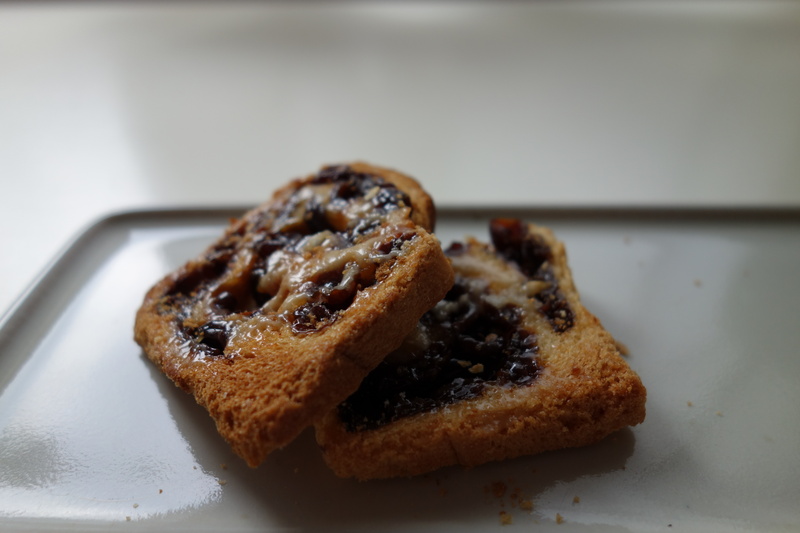 She says raisin bread is her specialty. The soft, white Japanese-style loaves are heavy with fruit. The rusks are crisp and chewy with a sweet hard icing, good with coffee. You know what, I’ve got a goldfish too, she says. 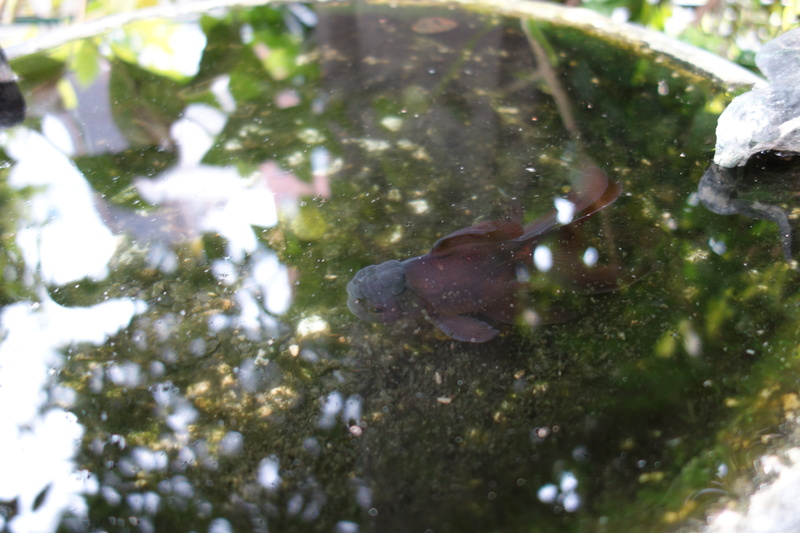 Outside under the mandarin tree she points into the reflecting pool in the mossy concrete birdbath, and there he is. She says, He’s dark so you can’t see him. He’s been there about four or five years. Most people walk straight past. But those who know, they stop in the morning and say hello. He likes bread, she says. That’s handy for a baker. You ask what he’s called. Kuro-chan – Blackie. Someone left him in a plastic bag outside one day, one of those festival days with the sideshows where you scoop up the goldfish with an absorbent biscuit that usually disintegrates before you can haul one out. Kingyou sukui. 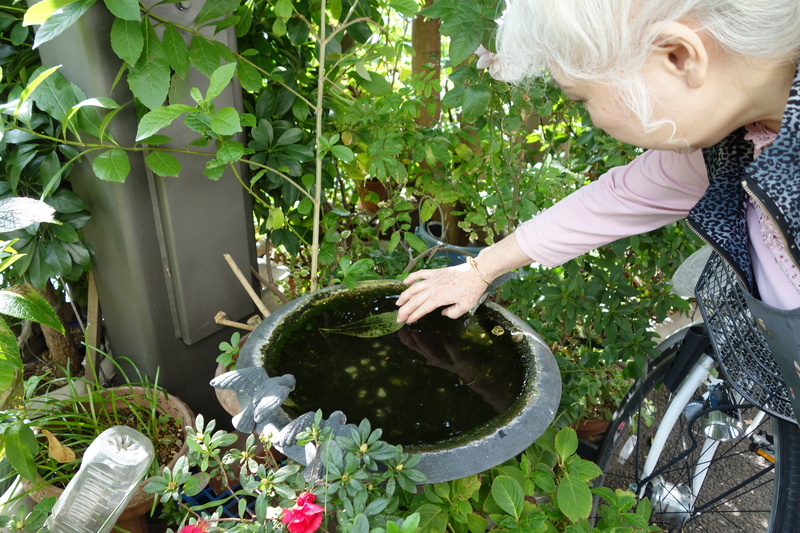 I didn’t know what to do with him, she says, so I put him in the birdbath. He was probably a prize. He was little, about the size of her thumb. Now he has a fatty, human sort of face, quite unusual. I have to move my plants, she says. In the New Year they’re extending the bike path up from Inaricho, so they all have to go. This wisteria has put roots into the ground, we’ll have to cut it. And after I went to the trouble to make this little pergola too. Can’t be helped. We’ll have to cut down the mandarin too, it’s put its roots through the pot. Nothing to be done. It’s what the country decides.